20 Inch circumference. Weighs 1 pound each. 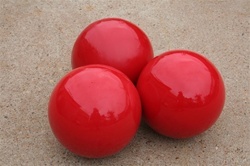 Polyurethane coated foam ball. Muhl Balls are the best power training option for baseball and softball when it comes to portability. The 1 pound per ball weight and their size allows the Muhl Balls to easily fit into most equipment and duffle bags. Hitters on all levels want to hit the ball with more power, but power training on the go isn't always a realistic option because of space and time. Well the Muhl Balls are the solution to both of those problems. Designed to build strength in the forearms and wrists the Muhl Balls have proven to increase "ball exit speed" and encourages hitters to enforce strong hip rotation, a major key to hitting with power and authority. Bat recoil is one element of hitting that is often overlooked. When the bat makes contact with a pitched ball, the bat flexes, along with some recoil allowed in the hands. The flex of the bat is something that cannot be controlled or eliminated, however the recoil in the hands can be. The weaker the hands and forearms are, the more recoil or "give" there is, translating into a weak or "mushy" hit. Increase the strength in the forearms and wrists and naturally the recoil will be reduced, translating into more powerful hits. That's what the Muhl Balls will help you accomplish. Build strength and hit harder!